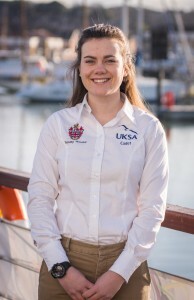 Annabel Fairlie, 20 is currently on phase one of UKSA’s Superyacht Cadetship. Annabel began her training in October after being selected for a coveted bursary by Trinity House. As a real alternative to university, the course combines study sessions and sea phase training at UKSA, with work as deckhands on superyachts. The course also includes a Foundation Degree in Operational Yacht Science delivered in conjunction with Falmouth Marine School and validated by the University of Plymouth. While working, students can typically earn €2,000 a month tax free (not including tips), and while once onboard a vessel almost all their living costs are covered by the yacht too. If sensible, students can graduate debt free and sail into a lucrative career. The 20-year-old from Cheltenham said: “I’ve always wanted an active career based on sailing, the ocean, or travel. My family have done yacht charter holidays and I started getting really interested in a sailing related career. I found out about working on superyachts and while I was in Italy I saw a few and my mind was made up, I think they are incredible. UKSA Cadetship Manager, Emma Baggett, explained: “With expensive tuition fees and graduate unemployment rates, vocational training has definitely become the new university – and ours is particularly in demand because of these bursaries on offer. The cadetship is a viable option for those considering vocational training over the traditional university career path. With the Foundation Degree recently being granted full-time status it can now be applied for through UCAS, plus successful 2014 cadets will be able to drawn down on student loans to assist them – as well as taking advantage of all the other associated benefits that full-time students enjoy.